A pursuit suspect bailed from a vehicle and hid in a trash can on Wednesday morning. 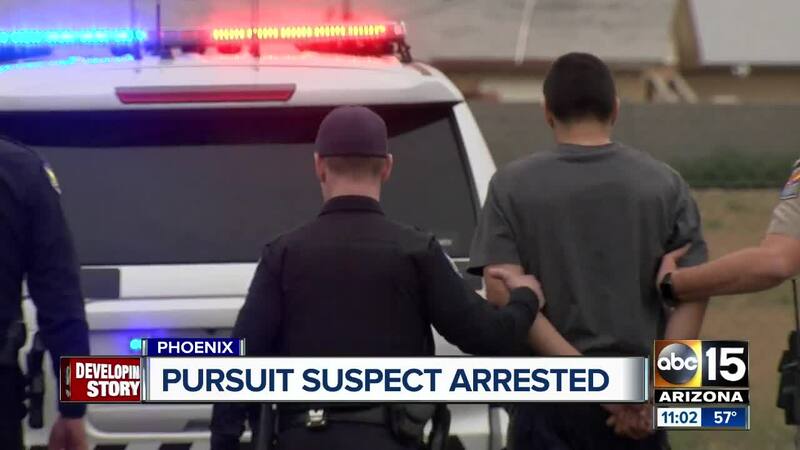 PHOENIX — A suspect who fled from a traffic stop in Phoenix has been taken into custody. According to Arizona Department of Public Safety officials, troopers tried to stop a vehicle near I-17 and Northern Avenue. The driver fled from the traffic stop, leading troopers on a short pursuit. DPS says a trooper reported the suspect tried to ram him during the incident. Officials set up a perimeter to search for the suspect who bailed from the car near 28th Avenue and Ocotillo. The suspect was taken into custody around 9:30 a.m. There is no word yet on why DPS initially tried to stop the vehicle.